Welcome to Daveys collection of heart pages.I hope that these Childrens Heart pages are helpfull , informative and offer support for Heart Children and their Familys.I thought that after living with Complex Heart Disease for the last 38 years that it would be nice to set up a homepage that could be serious and offer explanations to parents and their children while still being fun and happy. I was born in 1960 with a Single Ventricle and Tricuspid Atresia and have had lots of surgery and live with the effect of my condition , and how it effects my wife and Kids today . Still taking the tablets and having the X-Rays , ECG,s , Catheters and all the other things that Heart kids and their parents know so well...(Pottasium...Yuk)..I hope to change the pages and their contents and information as technology changes and Childrens Cardiology moves on. I will cover everything from ASD , Transplants , Cardiomyopathy and also the way society see,s Heart Kids/Grown ups regarding employment insurance,and things that sometimes people forget affect us. 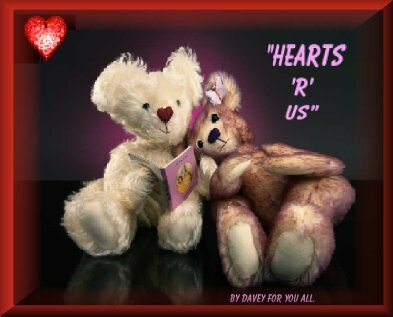 I hope you like the HEARTS 'R' US title.It kinda seemed appropiate.I have worked part time as a Family Carer in a busy Childrens Cardiac Unit in England for the last 11 years . I get too tired to be able to do full time but thats natures way of telling me to look after my Heart more carefully. All the diagrams and animations you see are drawn and put together by me using pictures from Official Journals in England and should be correct from a general point of view . Individual childrens Hearts can differ so much , even with the condition that i can only put up a standard picture.I,m sure your doctors have told you all about your or your childs condition and how it may differ in any way from other kids with the same problems. Please enjoy my pages and feel free to leave any comments in my guest book on my family home page or do email any time. Here is my Fontan Heart (note the conduit) blowing its top after a game of football with the kids in the garden.